A Flash Flood Watch has been issued for part of New Jersey. Such terrible timing. It seems everyone in New Jersey has a party, event, etc. planned for this grand summer weekend. And it's becoming clear that the timing and impacts of our impending coastal storm system will be highly inconvenient. --Short-Term Forecast: As expected, we've seen a couple of popup showers Thursday afternoon. The short-range HRRR model actually shows a couple of strong storms traversing the state later Thursday night, around Midnight. --Scenario #1 (The Flop): Seems unlikely now, with the entire model suite now supporting an deluge for the vast majority of New Jersey. 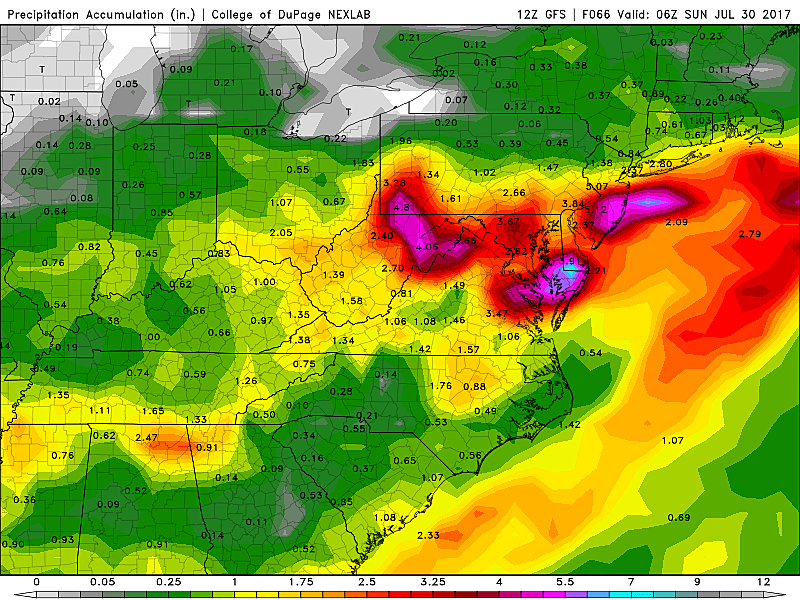 --Rainfall Start: Model consensus supports an earlier onset of moderate to heavy rain. Friday evening will get progressively pretty wet, possibly even affecting part of the evening commute/weekend getaway. --Heaviest Rain: Centered on late Friday night to early Saturday morning, say from 10 p.m. to 8 a.m. Flooding is likely. Severe weather (damaging winds and hail) is possible, along with some intense thunder and lightning. --Rainfall Totals: Widespread 2 to 4 inches, with the heaviest rain falling over central and southern Jersey. Locally higher amounts to 6 inches will be possible where it really pours. --The Big Problem: Antecedent moisture conditions — in other words, the status of the ground right now — is still quite saturated from last week's rain. That means it's not going to take much rain for flash flooding to occur. Roads may be impassable and low-lying areas may become quite dangerous. --Flash Flood Watch: The National Weather Service has issued a Flash Flood Watch for approximately the southern half of New Jersey, from Middlesex and Mercer counties south. The watch is effective from 2 p.m. Friday through 2 p.m. Saturday. --Coastal Concerns: We're still going to watch the Jersey Shore carefully, as a coastal storm (a.k.a. nor'easter) of this type is notorious for pushing a lot of water toward the coast. Initial guidance looks good, putting coastal flooding and beach erosion only in the "minor" category. Working in our favor is a relatively low astronomical tide through this weekend. --Rainfall End: The biggest question mark. There's still a chance we start to dry out after about 2 p.m. Saturday, but it's far from a guarantee. Even so, it's going to be a yucky afternoon: damp, grey, and quite windy. 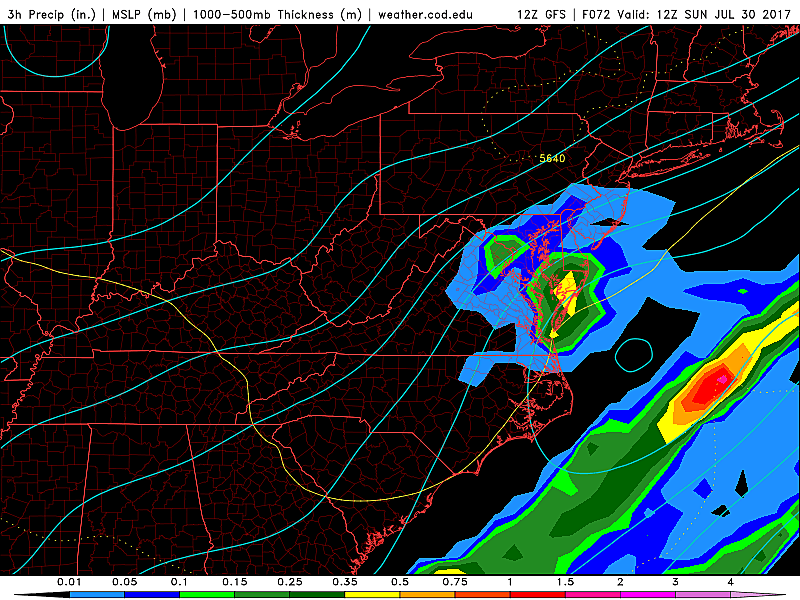 --Sunday: There's still hope that Sunday will be DRY for part or most of New Jersey. At the very least it will be DRIER than Saturday. But don't misread my guarded optimism that we might salvaging a piece of the weekend — the European model in particular shows unsettled, wet weather stuck over the Garden State through early Monday. --The Bottom Line: Friday night and Saturday look very wet, and flooding of roadways and waterways could be a big concern. The forecast for late Saturday and Sunday remains questionable. Confidence will continue to rise as new model runs and new information arrives. I suspect we'll have an even better idea of timing and impacts by Friday morning. Next weather blog update will be posted by 7 a.m. Friday.